A majority of cities—71 percent—will see Obamacare premiums rise by double-digits next year as more health insurers drop out of the exchanges, according to a report from the Kaiser Family Foundation. 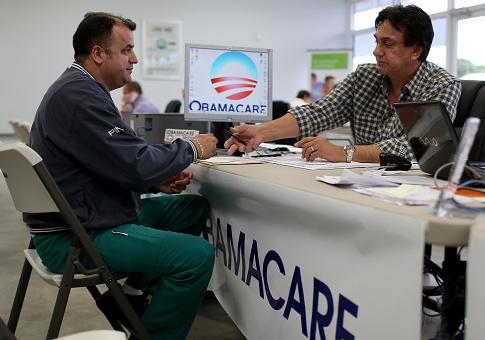 The study evaluated the cost of Obamacare's second-lowest silver plan. Roughly 71 percent of enrollees have this type of coverage. "The second-lowest silver plan is one of the most popular plan choices on the marketplace and is also the benchmark that is used to determine the amount of financial assistance individuals and families receive," the report states. Of the 21 major cities that were evaluated by Kaiser, 16 will see a double-digit increase in the silver-plan premiums next year. "Across these 21 major cities, based on preliminary 2018 rate filings, the second-lowest silver premium for a 40-year-old nonsmoker will range from $244 in Detroit, MI, to $631 in Wilmington, DE, before accounting for the tax credit that most enrollees in the market receive," the study said. Only one city will see their premiums decline, while in some cities premiums will increase as high as 49 percent in 2018. The number of health insurers participating on the Obamacare exchanges is declining as well, as many companies have decided to drop out. In 2014, there were 120 insurers participating in the marketplace in the 20 cities and in the District of Columbia. Next year, that number is projected to decline to 97, which is a 19 percent drop from when the exchanges began. "The vast majority of insurers included in this analysis cite uncertainty surrounding the individual mandate and/or cost sharing subsidies as a factor in their 2018 rates filings," the report states. "Some insurers explicitly factor this uncertainty into their initial premium requests, while other companies say if they do not receive more clarity or if cost-sharing payments stop, they plan to either refile with higher premiums or withdraw from the market." In addition to uncertainty, health insurers will have to pay Obamacare's health insurance tax that adds 2 to 3 percentage points to premiums, which is another factor affecting premiums. While some individuals will receive subsidies to insulate them from premium increases, the report notes that taxpayers will have to front the cost. "Because most enrollees on the exchange receive subsidies, they will generally be protected from premium increases," the report states. "Ultimately, most of the burden of higher premiums on exchanges falls on taxpayers. Middle and upper-middle income people purchasing their own coverage off-exchange, however, are not protected by subsidies and will pay the full premium increase, switch to a lower level plan, or drop their coverage."